As we say in rehearsal, "Let's take it from the top." I love that moment whenever we artists come to a studio like Zion to fashion an ambitious project... and we've gotten our instruments and gear all set up for Day 1 and the computers and tape machines are whirring, blank hard drives formatted and primed, lighting dimmed to a setting every studio has labeled "maximize inspiration", and your engineer/producer shifts to get comfortably dug into his control-room swivel chair as he presses a tiny button on his panel and leans his face into a 'talkback' microphone. And in your headphones you catch the completion of his midstream exhale as he lets loose those loaded words..., "Ok. So, what's first?" As alluded to earlier, I arrived straight from 10 days of buried brow in my baby grand at The Warehome, reading and researching (both inwardly and out) for inspiration and story, writing new material, throwing it out, rewriting more, hacking it up, toiling over whether to cover - and if so, which of - any wildly famous holiday tunes and how I might offer something fresh -- or at least personal -- to them. My baby (grand) - 1926 Chickering - weathered and faithful. Of those well known heritage songs, I landed on four of my all-time favorites. Two -- I Saw Three Ships and O Sing a Song of Bethlehem -- I had set to original arrangements some years before and had performed live in concert many times. I'd greatly anticipated getting to record and share them, so I needed only to tweak and polish their plan. The other two choices were classics I'd barely ever touched, even in the smallest of venues. Some compositions - to me - are just so venerated that I see holy caution-tape at their perimeter. But... the time had come to make a record. So, I got brave. "D, I think. Maybe E-flat. No, D. Not sure the exact metronome mark, yet. Maybe set it around 90? and just lemme block thru my changes awhile, and see if you can adjust to find where my hands want it to be." 'See if you can find where I wanna be??' Man... if I were Dallas, that kinda open-ended talk of divining my unspoken spirit-will would drive me bonkers. Especially over days and weeks. But Dallas is a superb studio-producing engineer who knows what's at stake, what's possible, and what it takes to get there. An artist in his own rite, he understands how and when to don or remove the right hat for a given production or musical situation. One of the most elusive and important things for me is to find a studio mate who 1) has chops, 2) possesses inordinate stores of patience and stamina, and perhaps most importantly 3) instinctively permits a creative soul all sorts of free reign to be fluid and free and cranky and giddy and exhausted and ginned and whimsical and staid and sad and euphoric and intelligible and dumbfounded and pithy and breathless... all in the course of a single session's work. And he does this by being a rock. An anchor. A nurturer even. There were chocolates or written jokes or a mug of coffee or whiskey at my piano-desk when I arrived the studio each morning. He draped colored Christmas lights throughout the tracking room in early November, just to make it feel Yule-ish for us all. Sometimes we'd arrive, and he'd brought in his two winsome pups who'd lounge on our laps as we'd play and record. A nurturer's instinct, DK. He always seemed to know how and when to either set or chase my mood and my muse... as well as those of each band-mate and guest musician we'd have along for a given session. Some Children See Him was penned in 1951 by Wihla Hutson, dear family friend and lyrical collaborator with the great carols-composing Michigander, Alfred S. Burt. The Burt family would write and publish a fresh Christmas carol every year (for 15 years!) for their mailed holiday card to their loved ones -- a tradition begun by Al's father, Bates Burt, an Episcopal minister. It wasn't until after Al's 1954 death from lung cancer at just 33, that his wife and eventually his performing daughter Diane saw his music come to reach worldwide acclaim and embrace, as part of America's heritage itself. And - as I'll share in greater detail in a future post - perhaps there's something more to my connection with this song... to its author's insights about children and not being a father myself, to Bates Burt's prescient insights about joy and loss at Christmas given his musical son's eventual early exit... and all this given that my own father's mother passed young as well, and also in the mid-1950s of a cancer. And too, she was a lovely pianist and singer who received great joy from her own son, my father. Yes, there's something in the essence of this song that has always resonated deeply for me. Like a perfectly fitting garment, it's always felt natural. A keyboard-playing child of the 1980s, I first fell in love with its essentially pentatonic melody thru George Winston's take from his seminal solo piano album December (1982). [Do your holiday favor and throw on Winston's December album today. Sneaky simple. Human and yet transcendent, never pedestrian. Trust me on this.] My father -- ever encouraging a passion in his inquisitive children for research and seeking the origins of things (We didn't have the Googles back in the 80s, kids) -- had known this song from his own youth and would sometimes hum its lyrics on drives thru town to look at holiday lights. This was my introduction to its lyrical content portraying all these diverse children surrounding the holy Child. But it wasn't until diving into the song for this project that I connected with the brilliance of Hutson's thrust: We tend to preoccupy with the divisions made by exotic differences in the external appearances of humankind; and yet here's the full range of the world's diverse children themselves unified in their focus, instead, on Him... and on the "Love that's born this night." It was then that I began to be taught, myself -- all November long, throughout the recording process -- by the message emerging in this music project. I wanted to be like those children and see God-with-us so purely, and join in their liberated songs to his Name. I needed to be refreshed with a strong dose of unlearning, and reconnect to a first Love known so fluently by the young. So, you can understand that I'd dreamed all my life about arranging and performing a version of this song myself. At last, the day had come. And, as happens for me with the best of them, the muse visited simply and directly. I poured a glass of evening port and sat at the Chickering, began in E-flat (later pulled it down), found a tempo I enjoyed, and began to sing. I let my hands plod thru chord voicings on their own -- not overthinking them -- while I pit my vocal phrasing in hemiola rhythm directly against a straight-quarters manual accompaniment, staying true to the inviolable vocal melody. The more I tested this rhythmic pattern the more it delighted me. I chose to keep it. The following day I composed some instrumental interludes and a coda to give it a more distant journey across the past century to ours, and to give the performer (me, in this case) that all-important space-and-time whilst listening to reflect on each verse just after it is sung. All that would be left was to prepare the spirit to perform it in studio, encouraging the heart to be fully engaged with Hutson's imagery and message so that I could ad lib in those interludes both at the keys and in the voice. This is a device I often return to in performance -- willfully getting 'caught up' in the moment of a piece of music. I find it most authentically humbles and unites myself and my listening audiences under the power of what we are both experiencing together. Jules (drums) and Corey (bass) -- longtime AJ Trio guys -- played on this and a number of other tracks on the album. To dress the arrangement, I brought in my longtime friends and band-mates: Jules Rodriguez (drums) and Corey Cofield (bass). I charged them to lay down the rhythmic foundations of the entire tune as a Trio, like we've done in myriad live performances thru the years. We had a lot of fun opening this project together that day. In short order, another friend and erstwhile bandmate Johnny Gomez entered to dress the track with his guitar tones. Johnny has spent the past few years digging in on his own "voice". He even released his first solo-artist project in 2015, recorded at Zion with Dallas not long after we wrapped The Bells. 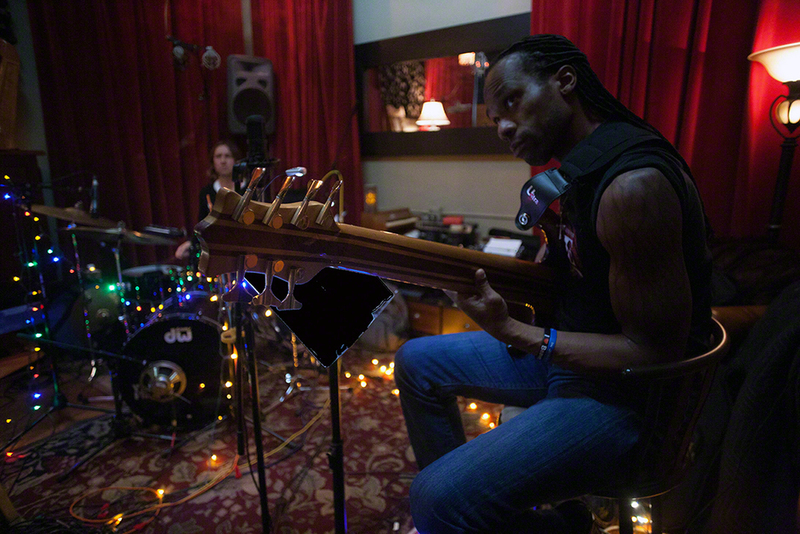 We've worked in studio before (his playing is prominently featured on a sacred album we did in 2011, Safe). On this track, I love hearing both his pocketed rhythm and support work and his ornamented lead tone in the interlude sections. Lights me up. In both studio and live arrangements of mine, I've often used Johnny's guitar playing as a "response" voice to my lead-vocal calls. And in that way, he does so much to beckon the listener to draft with his path as he drafts mine. Johnny G is featured on a number of tracks on this album. Justin Burrow and Dallas are dear friends, and JB and I go back to my time in residency at The Gypsy Lounge in Lake Forest. He played guitar for me for a number of consecutive years, and we've performed in many contexts including road trips up and down the state. If I'm not mistaken, we owe our introduction to mutual music friend Chris Paul Overall. Back in 2009, I brought both Dallas and Justin into my band for a private outdoor gig of mine, and it made for the first time they'd ever met and played together. The light went on instantly. They've been friends and prolific bandmates ever since. Justin cares deeply about the quality of his creative results -- whether the pursuit is musical or otherwise. You can find yourself immersed in just as cursive a string of conversations about philosophy or current events or music gear or art history as you will about how to approach a given piece of music, or a guitar solo. It had been awhile since we collaborated and Justin wasn't on my radar that day but... here he was! And Some Children See Him was all cued up, calling his name. Check out where he takes the tune once the Children have had their profound and delighting effect on their world and on me. We ultimately fade the track out but not before JB rails on the coda's changes with his signature taste and ferocity, interweaving gracefully through my piano improvisations. Someday - if you're lucky and you don't tell - I'll have you over to listen to a secret cut I've got of the rest of this track without fading out -- Justin's continuing melodic firepower as Jules, Corey, Johnny, Dallas, and myself carry him way out past the fences. You just can't open an album with a 10-minute opus! And finally as with each track, Dallas took great care to dress the song for its unveiling, with an arrangement of strings, synths, percussion, bells, and Hammon B-3 organ to send it over the top. I have to say... having anticipated this day literally all my life, you'd think my expectations would be too unfairly placed. However, I'll always look back on what that gaggle of gunslingers crafted with me on this tune with utter delight and satisfaction. The composition itself was wrought in some pure and eternal forge back in 1951. I hope - and believe - we've paid it sound homage with our very best in 2014.